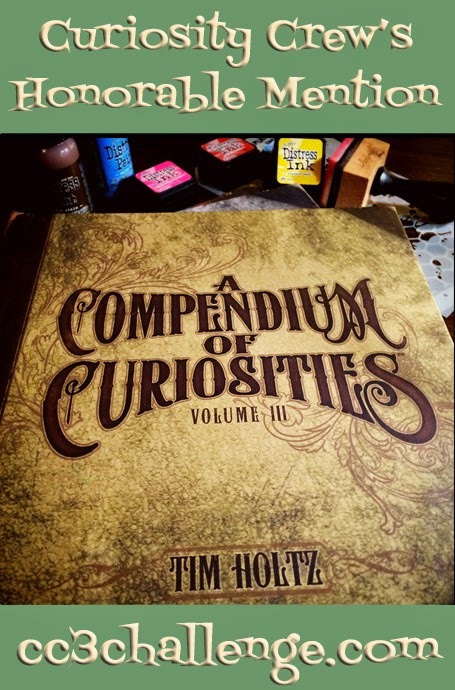 I really enjoyed the first round of Linda Ledbetter's Compendium of Curiosities Challenge, based on Sir Tim's new book (and even better they picked me for a mention - see below). 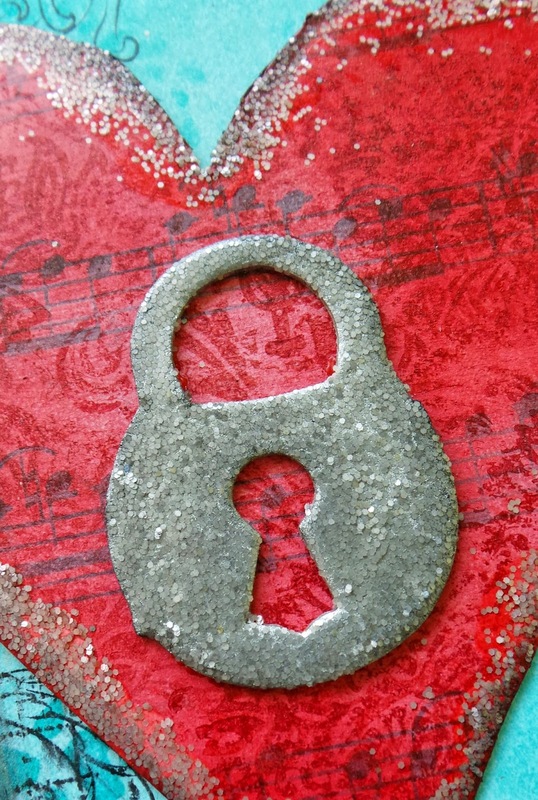 This challenge from Vol 3 is working with Distress Glitter. Totally different style of tag this time - I even tried to add some colour! At the risk of creating a sense of deja vu... I only have two colours of Distress Glitter. And I have to confess I only have those because they were half price when a local shop closed. I don't generally 'do' glitter - I am not a very girly girl at all. I've also never opened them (hangs head in shame...). Due to the facts shared above, I ventured into this challenge with some trepidation. I started to play and although the glitter is much less blingy than 'normal' glitter, it still felt a bit overbearing to me. As I was playing I decided to disregard Tim's instructions (I know - sacrilege!) and instead I rubbed the glitter back quite hard before step 4. I LOVED the softer result - phew! Challenge saved! 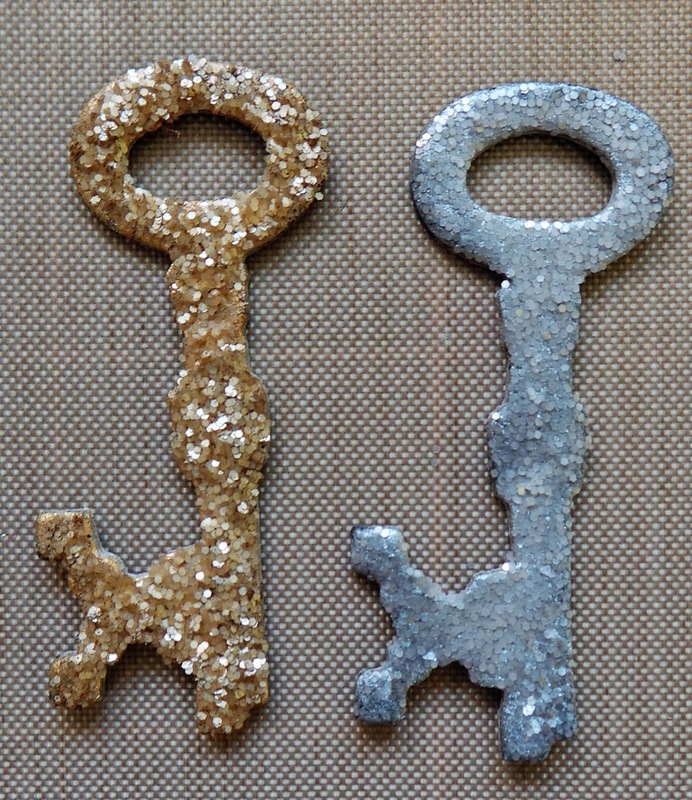 The key on the left (gold) shows the method in the book and the silver one shows my variation. The glitter (Pumice Stone) is over a bed of Brushed Pewter Distress Paint so the metallic shows through where the glitter coverage is thin. The photo doesn't show it well, but it does still sparkle, though it's much more subtle. It also has the most gorgeous texture. This time the challenge sponsor is THE FUNKIE JUNKIE BOUTIQUE so great prizes up for grabs again! Make sure you play along! Just before I go I was super chuffed to be given an 'Honorable Mention' for my tag for CC3C1 - thank you to the Curiosity Crew for this wonderful honour! Made my day :). Stamps/products used: Distress Glitter - Pumice Stone; Distress Ink - Barn Door, Broken China, Peacock Feathers; Tim Holtz Layering Stencil - Doily; Tim Holtz stamps - Visual Artistry and Distressed Damask; Sizzix die - Key and Keyhole; Kaisercraft stamp (grid). Congrats to you on the Honorable Mention!!! Love that you had some glitter laying around and that you like it although not a glittery girl...me either...lol! The keys are fabulous, and love the sentiment! Thank you so much for joining us at CC3 Challenge!!! I totally relate to your post, I too am not too glittery inclined. Love what you did with the paired back approach, it adds a nice texture to the grunge. Great job and congrats on the last one too. Congrats on your Honorable Mention!!! So happy you decided to keep playing! Love your creation and love that you "tweaked" it to suit your creative needs!!! That's what is all about...creative play! Fabulous...love your tag. Thanks for playing along again!!! I'm like you with the glitter... notsomuch a part of my daily uses! Love how you've done this and I really like the arrangement of the sentiment and offset heart on the tag. So glad to see you again at CC3C!